Kings Beach offers many exciting options to explore the beautiful blue water and get your adrenaline pumping. And you don’t need to go out and purchase equipment to get in on the thrills. There are great places to rent gear to start your adventure on the water. 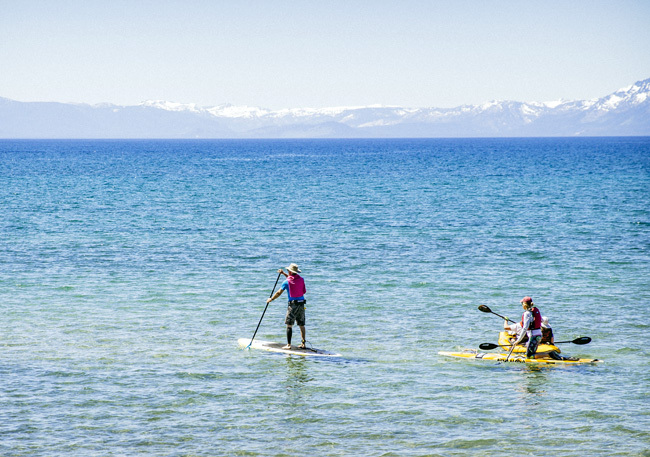 Tahoe Paddle & Oar offers quality, top-end kayak, canoe and paddle board rentals. They also offer tours for all skill levels with experienced guides that will give instruction and even facts about the lake. North Tahoe Watersports is a great option with it’s beachfront location and wide variety of activities. There’s something for everyone. They offer favorites like stand-up paddle boards, kayaks, jet skis, big-wheeled aqua cycle trikes and pedal boats to play on the water. 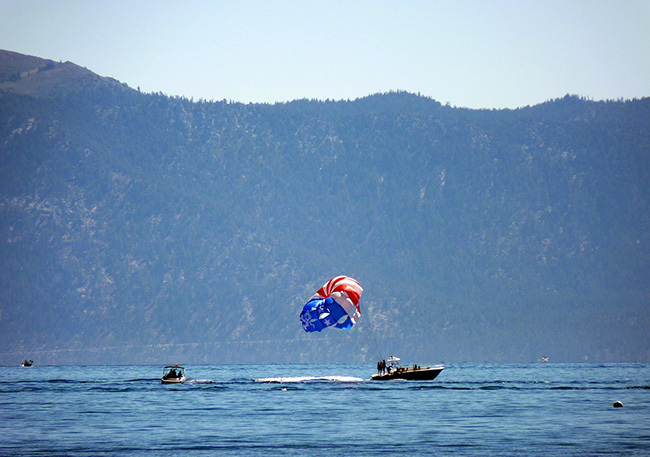 But if you want to get an epic view of Tahoe from above, book a parasailing trip and sail up to 800 feet over the water. 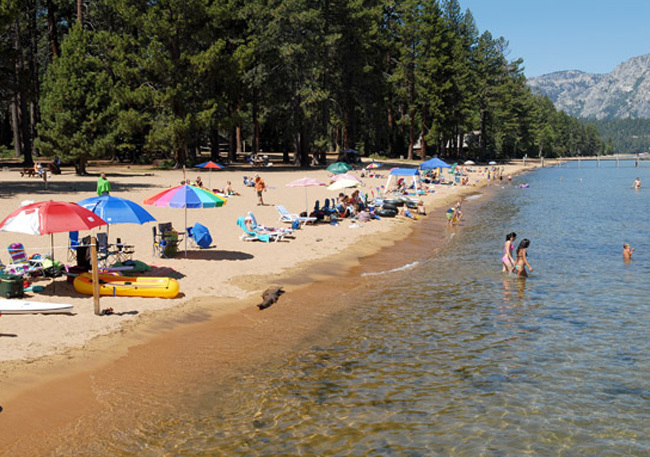 Zephyr Cove is packed with action and is a popular Tahoe beach. Activities include boating, fishing, volleyball, parasailing, paddling and camping. Power/ski boat, pontoon, jet ski, paddle boards, kayak and pedal boat rentals are available, as well as, wakeboards, water skis, ski tubes and wetsuits. End your day with a sunset cruise on the famous M.S. Dixie for a timeless Lake Tahoe evening. This beach has a little of everything from beach volleyball, tennis and basketball courts to a wide variety of watercraft rentals available, West End Beach is a great family-friendly beach with lots to do. Pedal boats, kayaks, stand-up paddle boards, sailboats and inner tubes are available to rent directly off the beach. If you’re up for a great work-out in a beautiful setting rent a bike from Bike Truckee in Historic Downtown Truckee and ride along Donner Pass Road along the north side of Donner Lake all the way to West End and cool off in the water, grab a quick bite from the snack bar before making your way back. 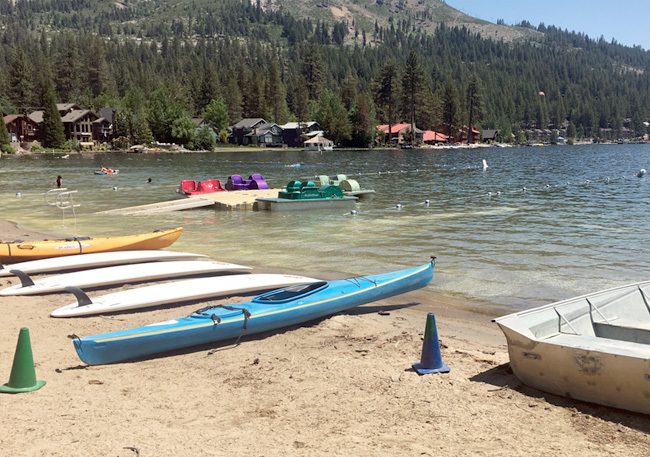 Skip the beach all together and spend the day on Donner Lake’s cool, clear water No boat, jet ski or paddle board? No problem…head to Donner Lake Sports to start your day on the water. They offer a wide variety of motorized watercraft rentals including aluminum fishing boats, pontoon boats, wake/ski boats and jet skis. If you want a little less speed and a great workout, they have stand-up paddle boards, pedal boats, hydro-bikes, canoes and kayaks available. There are many popular sections of the Truckee River to raft, kayak, tube or even paddleboard between Lake Tahoe and Reno. One fun route starts at Mayberry Park in West Reno to Downtown Reno. It’s a pretty easy going section of the river with small rapids and calm relaxing stretches. Another memory-making option is to start from Tahoe City and make your way to River Ranch. This route features fun rapids and long stretches of scenic alpine meadows and views of the surrounding mountains. For a no-fail trip on the Truckee, I recommend Truckee River Rafting. The rafts are commercial grade, life vests are included and the return shuttle service makes it so easy. It’s fun for all ages and kids ages 2-5 are free! Camp Richardson is an exciting, historic resort filled with activities including cycling, boating, hiking, horseback riding, camping and paddling. They offer power boat, kayak, jet ski, pedal boat and SUP rentals, as well as Rum Runner lake cruises and parasailing. Enter to win our California 89 Summer Fun Giveaway – jetski on Donner Lake, ride an electric mountain bike around Truckee, paddleboard on beautiful Lake Tahoe, run the rapids on a rafting trip down the Truckee River, or parasail over Lake Tahoe! Click here to enter to win over the remaining weeks.